It’s not every day that an online cropping tool gets us excited, but when we first saw Croppola, that’s exactly what happened. 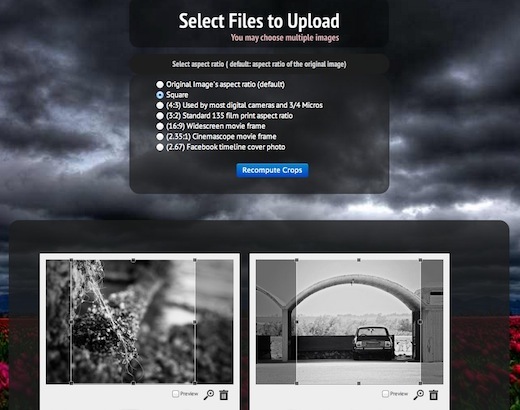 The free online service offers users several different ways to crop images, using a unique content-aware method where Croppola intelligently figures out which parts of the image need to be cropped out. You can upload several images simultaneously, and then pick and choose between seven different aspect ratios. The default setting on Croppola simply crops the photo down to the most interesting part of the image. Other pre-set crops include square, great for figuring out how to crop your images for Instagram, as well as the dimensions of the Facebook timeline cover photo, and standard 135 film, if you want to print your photos a certain size. Croppola uses an AI-based algorithm to find the best composition for your photo – so if you’re out and about shooting fast, you can always get the perfect composition after the fact. If you want to try out all the different crops with your image to figure out which one is right, simply hit the ‘recalculate crop’ button and you’re on your way. You can download the cropped photos to your computer in one zip file. Croppola takes all the hard work out of the process, and on top of that, it comes packed with crops that will come in handy on a few social networks. We’re sold.